Blackjack card game has a lot of variations all over the world, and this fact makes it even more interesting and attractive for gamblers as they can choose one perfect blackjack variation for themselves to play. Among all these blackjack variations, Pontoon takes the special place because it is the most popular European blackjack game. 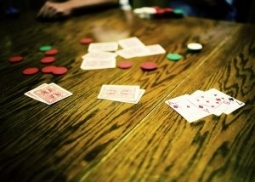 Pontoon has many features in common with a traditional American blackjack though it can show you some specific rules and conditions to gamble it of course: today Pontoon can be easily found in all online casinos, and the object of this blackjack variation stays the same: to beat a dealer without exceeding 21 points. Due to the fact Pontoon is the British card game its players should know British English names of terms a bit in order to play Pontoon confidently and without any problems. Some blackjack terms sound differently if you play Pontoon and it would be not out of place to learn them in order to understand this game properly. So. Actually, there are not many differences between traditional blackjack's rules and Pontoon's once: card values are the same for both games, the object of the game is also the same. So, what makes Pontoon being so specific for gamblers to play? The list of rules differences are shown below. 1. Pontoon is played with 8 decks of 52 cards; 5-8 players take part in the game. 2. Every player can actually be a dealer when plays Pontoon: initially, the dealer is a gambler whose up card is the highest; as for minimum and maximum bets, players determine them themselves. 3. Pontoon strategy differs a bit from the one of conventional blackjack. 4. Two cards of a dealer are usually dealt faced down while a player's two cards are always faced up. 5. A dealer will always be a winner until the time s/he BUST: a dealer has a right to take additional cards till the time s/he reaches 21 points or bust. 6. Pontoon offers three special rules which can not be met at conventional blackjack: Pontoon, 3-4 Cards of 21 Points and Five Cards Trick. 7. Payouts for Pontoon and Five Cards Trick are 2:1; all other card combinations are paid as 1:1. Pontoon: the combination of 2 cards, the same with Blackjack - an Ace + a Face card or 10's = 21 points = Pontoon. 3-4 Cards of 21 Points: if your 3 or 4 cards give you exactly 21 points, you will beat all other card combinations except Pontoon and Five Cards Trick. Five Cards Trick: if your hand of 5 cards does not exceed 21 points, it will beat all hands except Pontoon.